Noche Flamenca’s summer intensive dance program in New York City was designed to provide a global approach to dance training. Classes in Dancer Preparation & Conditioning, Hip-Hop, Modern Dance, Flamenco, and Composition and Choreography provided a 'big-picture' understanding of the world of professional dance. Incorporating holistic interdisciplinary dance training, students learned how to associate movement with an awareness of the body’s potential for expression. The goal is for an aspiring dancer to understand the fundamentals of various dance forms and how these elements can be utilized to push beyond the limitations of their current personal practice. Noche Flamenca Artistic Director, Martin Santangelo’s objective is to provide the absolute best training in the most economic manner, making dance education accessible to everyone- an extraordinary opportunity for dancers to receive training and education taught by artists of the highest caliber. Tuition included classes, Mon-Sat, for 3 weeks beginning June 18th (schedule below) and a culminating performance on July 7th at the West End Theater. •Tickets to a performance at The Joyce Theater, the premier dance venue in the U.S.
•Q&A with special speakers from the professional dance community of New York City. This class is an essential preparation for professional dancers of any discipline. It included strengthening, flexibility, alignment, and conditioning - all necessary tools to develop a consciousness and profound understanding of the body. This approach is critical for any dancer to be able to create their own unique and individualized daily practice adapted to the needs of their own body. Knowing your body helps to avoid injury and prolong your professional life as a dancer. This class focused on the Andalusian art form that was born of great pain, joy, and a myriad of extreme circumstances. These life experiences required people to find catharsis through dance, song, and music. Flamenco technique, choreography, and culture was also taught. Unlike other dance disciplines, flamenco does not require a certain body type. Like hip-hop, one can put their own personality and improvisational style into the dance rather than fitting into a certain mold. Both disciplines connect strongly with the earth and an ancestral culture and share complimentary foot work. Flamenco shoes provided by Noche Flamenca. Breaking (wk1): This class focused on the foundational elements of this highly physical dance. From 'top rocks' to 'go-downs', 'footwork' and 'freezes', students learned the importance of practice, ciphering, and battling. Waacking (wk2): This class explored the dances linked to the Disco and House eras- based on physically engaging the dance while experiencing one’s core essence. Rooted in music and activating each part of the body, it allows freestyle (improvisation) to happen naturally. House- “Like a Nubian” (wk3): This class focused on club-style dance, bringing awareness of moves to the music. 'Footwork', 'legwork', and 'floorwork are just a few elements that were worked on. Jeanette provided students with a creative dance experience that included classical modern dance technique and improvisation and explored the dance elements necessary to develop performance skills. This class explored and examined the theory and practical applications of composition & choreography. It allowed students to understand perspective, reveal how movement manifest within space, and how to use compositional guidelines to express specific ideas. Through music and vocal (song) structure, students were able to learn the rules of composition and choreographed short pieces based on what they learned in the other classes, to be discussed, analyzed, and then performed at the conclusion of the workshop. MARTÍN SANTANGELO (Artistic Director) founded Noche Flamenca. He studied with Ciro, Paco Romero, El Guito, Manolete, etc. He has performed throughout Spain, Japan and The Americas, and Australia. He also appeared in Julie Taymor’s Juan Darien at Lincoln Center. He choreographed and performed in Eduardo Machado’s Deep Song. He choreographed a production of Romeo and Juliet at the Denver Theater Center. His most recent production was ‘Antigona,’ which toured the globe. Martín has been blessed to have worked with Lee Breuer, Luis Valdez and Jerzy Grotowski. SOLEDAD BARRIO (Choreographer & Dancer) was born in Madrid. Recognized as “one of today’s great dancers of any genre,” she is a founding member of Noche Flamenca with her husband Martín Santangelo. Ms. Barrio has appeared as a soloist with Manuela Vargas, Blanca del Rey, Luisillo, El Güito, Manolete, Cristóbal Reyes, and El Toleo, Ballet Español de Paco Romero, Festival Flamenco and many other companies. She has performed throughout Europe, Japan and North and South America with such artists as Alejandro Granados, El Torombo, Isabel Bayón, Jesús Torres, Miguel Pérez, Belén Maya, Manolo Marín, Javier Barón, Merche Esmeralda, Rafael Campallo, etc. She is a resident teaching artist at NYU Tisch School of the Arts, Drama. Ms. Barrio has won awards from over 15 countries for her excellence in dance, including a "Bessie" award for Outstanding Creative Achievement and a 2015 Dance Magazine Exceptional Artist award. MARINA ELANA (Dancer) began her studies in Spanish classical dance and flamenco at a young age. In Spain, she studied with artists such as Belen Maya, Isabel Bayon and Soledad Barrio. Marina has performed with companies across the United States including Theatre Flamenco of San Francisco, Maria Benitez’s Teatro Flamenco in Santa Fe and Yaelisa & Caminos Flamencos. She has been a company member of Soledad Barrio & Noche Flamenca since 2012 and has toured with them both nationally and internationally. Marina graduated from Stanford University with a BA in Film & Media Studies. NUBIAN NÉNÉ (Dancer) was born and raised in Montreal, and is mostly known for her waacking and house dance styles. She has become a well-traveled dancer, teacher and choreographer. In the fall of 2015, she co-choreographed a piece with her partner Dominique-Sophie, which explored the house dance culture as lived in New York City, and performed it at ‘Place Des Arts’ in Montreal for the 100lux dance festival. In 2016 she toured with the Bboyizm Dance Company in Fredericton, New Brunswick and in the Greater Toronto Area for 6 weeks. Recently, Nubian Nene presented her first 15- minute dance/poetry solo ‘STANCE’ part of the Under Exposed banner at Dixon place, which offered her audience ‘a glimpse at being a woman and black’. She extended this piece while on an artist residency in Panama in August. 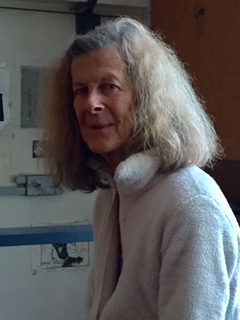 JEANETTE STONER (Choreographer and dancer) teaches improvisation and composition. She has performed with the Alwin Nikolais Dance Theater, Nancy Meehan, Elina Mooney among others. She taught at the Nikolais/Louis Dance Studios, NYU School of the Arts, Sarah Lawrence College, American Centre in Paris, University of Minnesota, University of Illinois at Champagne Urbana, the Young Masters Program at the 92nd Street Y with Laura Marchese. Her company, Jeanette Stoner and Dancers, has been performing for forty years. A-The Summer Intensive Dance Program will be held at the Noche Flamenca Studios located at the West Park Church, 165 West 86 Street (corner of Amsterdam Avenue), on the Upper West Side of New York City. A-Contact Marina Elana at marina@nocheflamenca.com and (650) 513-0734. A-No. It is not necessary but would be helpful if you had some experience in one or all the disciplines, whether performing, taking classes, etc. A willingness to participate and learn is fundamental and mandatory. A-All participants are required to take all classes. A-Yes, there will be a showing on the evening of July 7th. A-We would like for all students to participate in the final showing. A-You should bring your own water bottle and snacks. A-Attendance is essential. Missing more than one day of the workshop may result in you not participating in the final show. A-No. Each participant is required to pay in-full at the time of acceptance. A-Both options are available for all. A-We ask that all participants who are injured or sick attend classes as an observing participant. A-Each participant will have an assigned space to leave their attire at the studio.